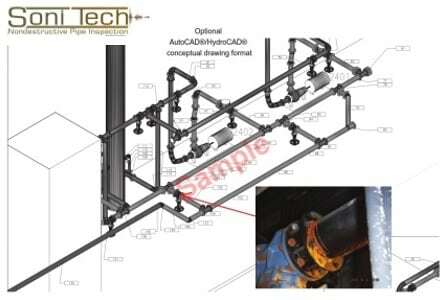 At SoniTech, we know that traditional methods of inspecting today’s most crucial piping systems are unnecessarily risky, antiquated, and grossly limited in their data. 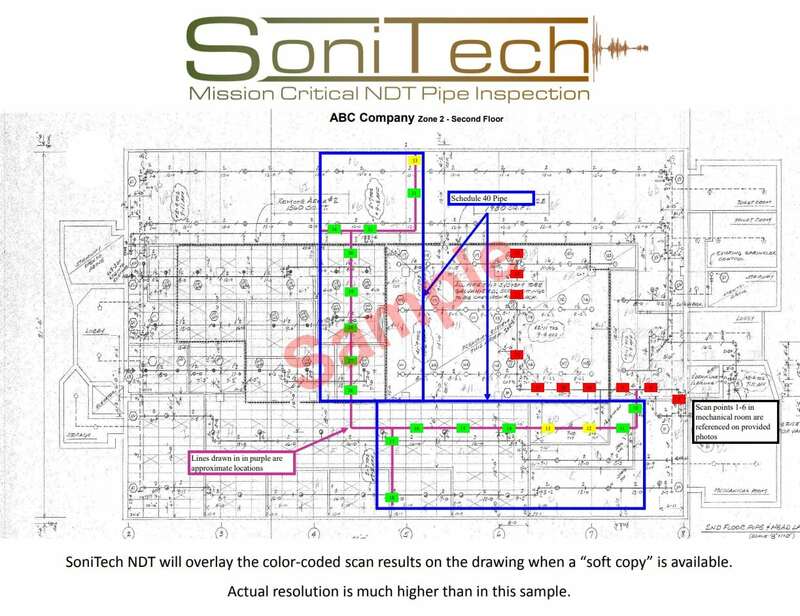 SoniTech’s Ultrasonic Localized Guided Wave (ULGW) noninvasive inspection methodology offers the most comprehensive and efficient technique available to evaluate the severity of all common internal integrity issues within most piping systems. 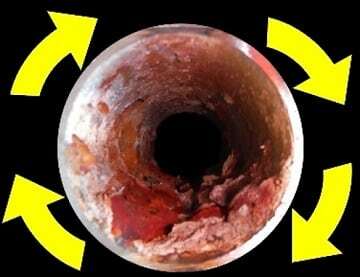 Corrosion/scale buildup, pitting, residual water in dry/pre-action systems, air pockets in wet systems, velocity erosion in loop piping, pump cavitation, and ice are examples of what can be detected. 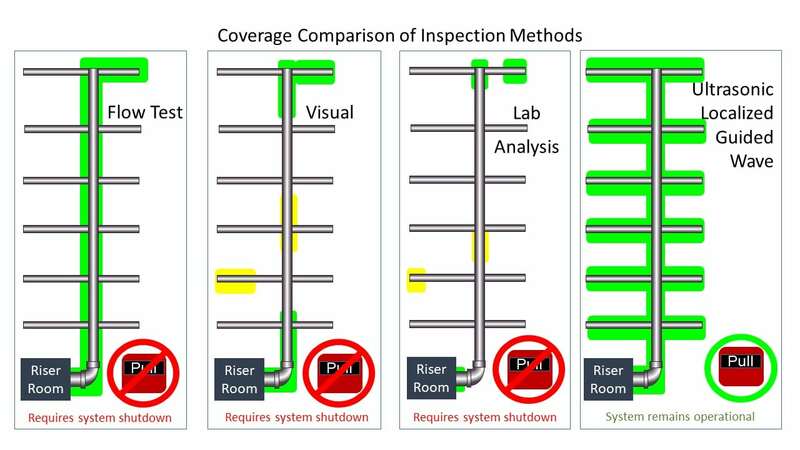 Property Owners, Facility Managers, or engineers only get partial information using traditional pipe inspection methods, forcing them to make undereducated decisions. Poor information can consequently result in unnecessary and costly repairs, or more importantly, unknowingly relying on compromised pipe to protect their property, equipment, inventories, and staff. SoniTech’s advanced ULGW nondestructive pipe inspection technology has taken a huge leap over traditional testing methods and even over other forms of ultrasound in convenience and value, offering the most efficient, comprehensive, and cost effective method available to survey pipe wall integrity. ULGW offers accurate and detailed third party data reporting of the system’s internal condition, all while the system and your facility operations remain fully operational. 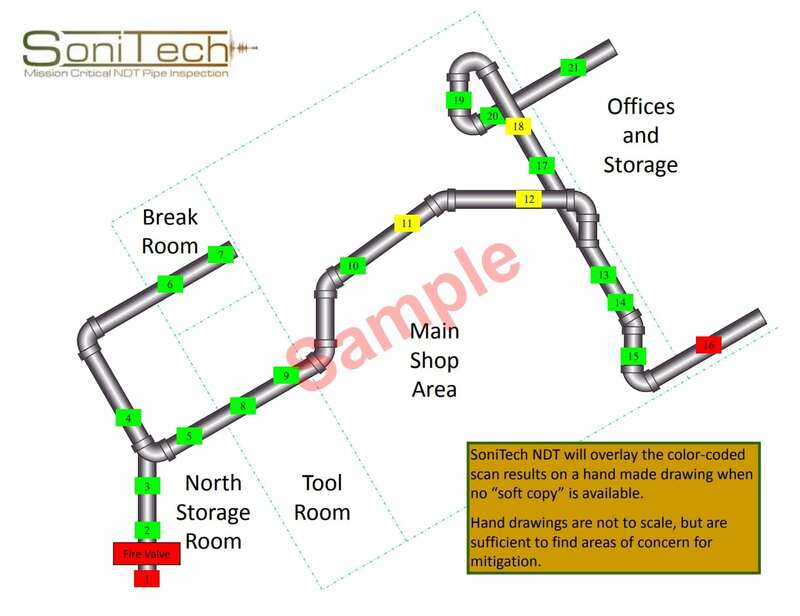 With a team of 2 trained technicians using a handheld ULGW scanner, SoniTech NDT pipe inspection can quickly and accurately map the corrosion in your system(s). Since all data is collected from the outside of the pipe, the risk is similar to changing a lightbulb. There is no need to shut the system down, and in the case of fire suppression, no need for a fire watch and no risk of difficulties bringing the system back online. By driving a unique type of ultrasound around the full circumference of the pipe, the ULGW wrap wave signature represents issues located anywhere around the pipe wall. 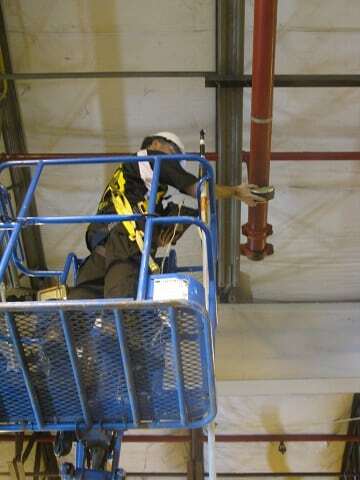 Furthermore, ULGW is the ONLY known method capable of detecting air pockets trapped within wet fire sprinkler systems. Due to these expanded ultrasonic capabilities, SoniTech’s proven method is accepted by the NFPA and many commercial property insurance carriers, as well as for many government oversight requirements. 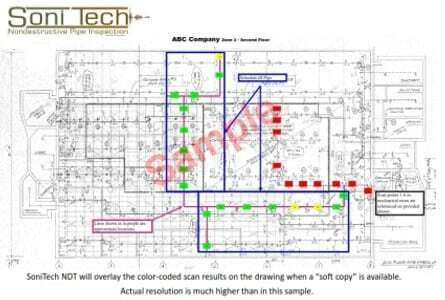 While the deliverable can be customized for specific client needs, a typical report includes easy access to pertinent information in a concise executive summary, along with color coded drawings showing locations with zero, moderate, or severe corrosion, as well as locations with trapped air or water. For quick reference, tables of numeric data are presented after the drawings, and detailed data pages for each scan location are included in the back of the report for those who want to drill down to specific data points. Since SoniTech does not repair these systems or have any affiliation with services that do, SoniTech’s reporting remains completely unbiased. This allows you to make accurate fact based mitigation decisions derived from actual system condition, rather than guessing based on partial or inaccurate information. Ultimately this information helps prevent unnecessary risks and expenditures, and more importantly prevents costly and catastrophic failures, with minimal impact on daily operations and budgets. Click here to request a copy of a sample report. Chapter 14 of NFPA 25 requires an “Internal Piping Condition and Obstruction Investigation” be performed on fire sprinkler systems every 5 years. 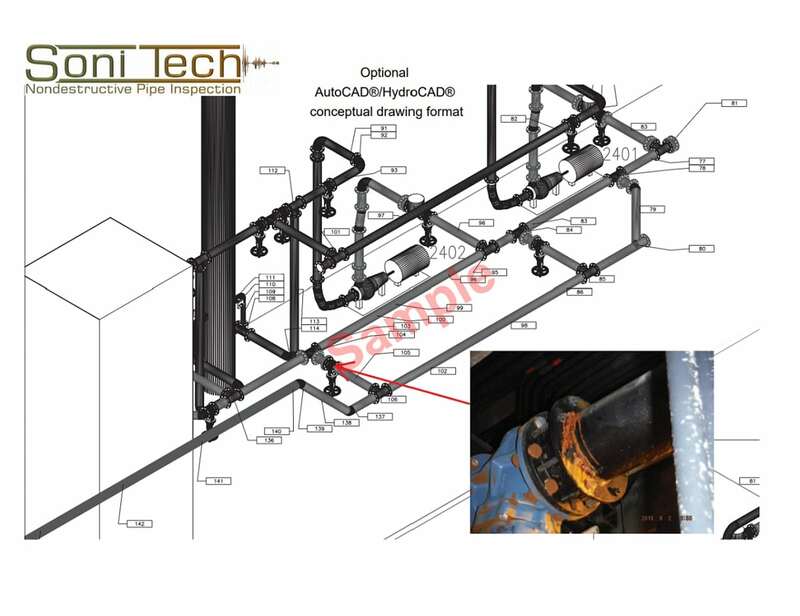 Due to the ability to detect all internal pipe integrity anomalies, SoniTech NDT’s innovative ULGW method is accepted by the NFPA to satisfy these requirements as an alternative method. You are no longer required to purposely flood the potentially compromised piping above your sensitive equipment, inventory, or processes to stay compliant with this requirement. Please Contact Us for more information. SoniTech has saved its clients from catastrophic failures and millions in unnecessary expenses over the past decade, while evaluating piping systems in a wide variety of facilities ranging from a simple parking garage to the highest level of military and technological sites. Most clients have highly sensitive business models preventing us from citing specific examples, but if you use the internet or a cell phone, drive a car, take medication, watch TV, or have been arrested, we have probably tested a piping system protecting the equipment providing those goods and services. 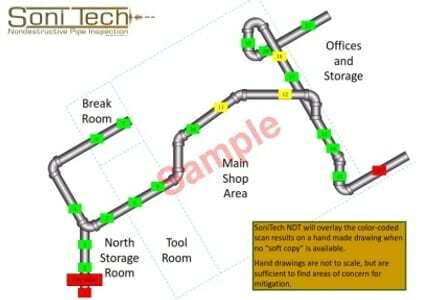 SoniTech provides non-destructive pipe inspection services on a global scale, mapping the location and severity of internal pipe integrity issues with little to no risk or logistical outlay for our clients.